Merge isn’t bringing anything new to the scene with its headset, despite its kid-friendly and intuitive design. Where it does innovate, however, is through the Merge Cube. Unlike anything we’ve seen on the market before, one of the biggest compliments we can pay this charming toy is that it simply works. There’s minimal hassle in setup and use, and that’s invaluable considering its target audience. There’s not a huge amount of app depth right now, but developers should help turn this into a more rounded package over time. Over the last few years we’ve seen VR become more accessible to the masses, with budget mobile options like Google Cardboard, Samsung Gear VR and a swath of startups helping open the door. It’s not just giving you a better look at videos produced in AR platforms, either. 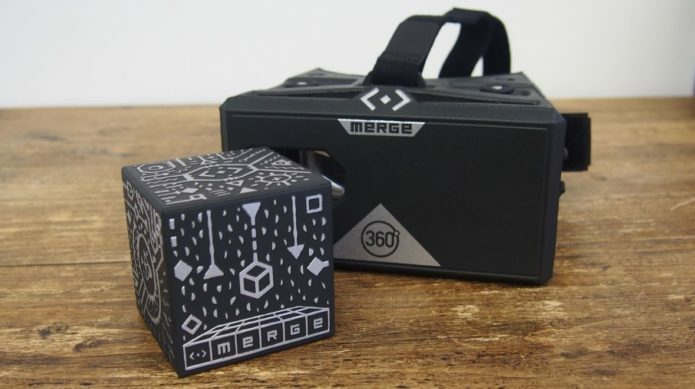 Pairing with the existing Merge headset is its new AR toy, the Merge Cube, a multi-dimensional, interactive tool aiming to unlock the next frontier. But how does it actually fare when in use and compared to other headsets? Well, we’ve been having a play around with both the headset and the Merge Cube peripheral for the past couple of weeks in order to find out. This is undeniably a budget headset, with a foam material the company describes as “marshmallow soft” used all over the exterior. However, with this being a headset focused at a younger crowd instead of seasoned VR fans, it’s something which works perfectly. If you drop it on the floor, there’s no chance of anything coming apart, and the phone slot manages to keep your smartphone in place thanks to a tab at the top of entry. Users of bigger devices may find it a bit of a tight squeeze to get into the 5.5 x 7.5 x 4-inch headset, but it’s still manageable, with Merge recommending use of iOS and Android phones between 123mm and 158mm. And with users coming with a wide range of different head sizes and eyes, the device also features adjustable lenses – something we found quite useful over at Wareable HQ when switching between users for brief plays – and a one-size-fits-all strap. It rested over our ears a little uncomfortably, but nothing that interrupted the action too much. And though you’re unlikely to pick this headset up for its advanced technical specs, its field of view is a respectable 96 degrees, while the lenses rest at 42mm. What is a nice touch, too, is the two buttons sitting on top of the device, allowing you to interact with games developed for Merge with ease. And until the company releases a remote control, which it says it’s working on, this is the next best alternative to breaking your smartphone out of the enclosure on a frequent basis in order to interact. Overall, it’s not a design that’s winning any awards for aesthetics, but it manages to provide you with a solid experience while protecting itself from accidents. It’s not trying to be Oculus Rift, or even a Gear VR, and that’s obviously a positive in terms of design and remaining at a reasonable price point of $49.99. 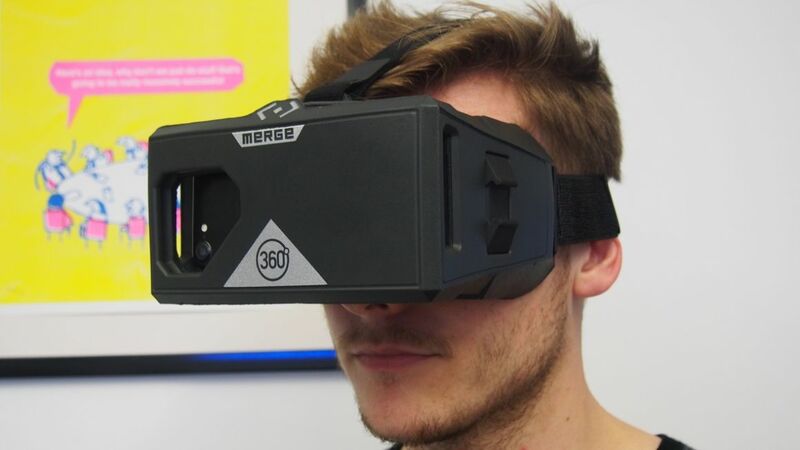 We won’t go into too much detail about the overall use of the Merge VR headset. It’s a fairly standard affair, which, while not blowing you away, does hold its own when compared to more expensive mobile headsets. The real headline act here is how it interacts with the Merge Cube, which is sold separately to the headset itself (or bundled in a slightly cheaper package). Once you pop the foam window out of the headset to make way for the camera, this opens up the world of AR. 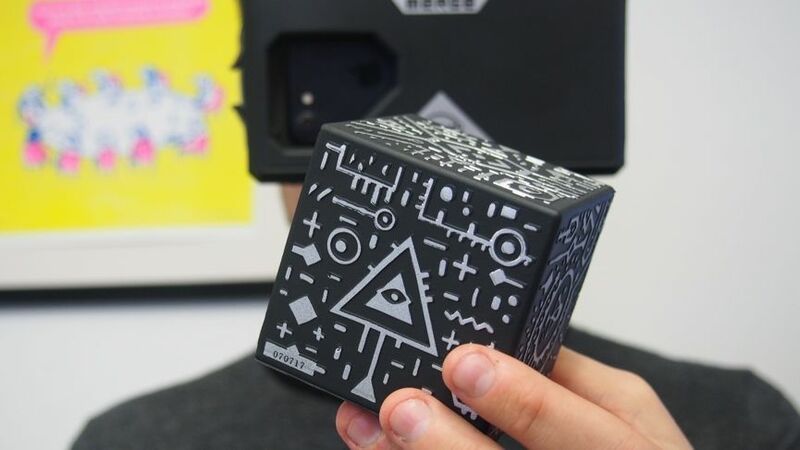 All users need to do is bring the Cube (which kind of resembles a Piece of Eden from Assassin’s Creed) up into the camera’s view before its patterned code transforms the spongey device into, well, pretty much anything. This has taken on the shape of everything from interactive brains in Anatomy AR+, which helps teach you about different areas of the human body, to a six-sided Minecraft-like world in Dig! Naturally, another game, Solve!, is also available to mimic the process of solving a Rubik’s Cube, while Galactic Explorer will let you use the cube to create a holograph of the solar system. When you’re using the Cube with the headset, it flattens the environment and essentially tricks your mind into thinking you’re holding different kinds of digital objects. The app understands what pattern it’s looking at, and based on that design, and how it’s orientated, it’s able to produce a realistic hologram. So while Merge is offering innovative smarts in terms of the Cube’s design and applications within AR, how does it actually work in practice? Well, on the whole, much better than you might suspect. Once the phone’s camera has picked up on the Cube’s whereabouts, which is usually instantaneous, it rarely glitches out. Even when your hand is covering most of the cube or some is out of picture, it’s still able to remain in its digital representation and keep you in the fun of the moment. And the fact you can bring in the cube right next to the headset in order to scan the projection is impressive. With that said, some may find the overall concept slightly jarring, particularly when first throwing yourself into a game which involves a lot of Cube movement. You may be used to immersion, but this is something very different to get your head around. Providing you tune the focus correctly and start things off slow, though, you shouldn’t experience too many problems. 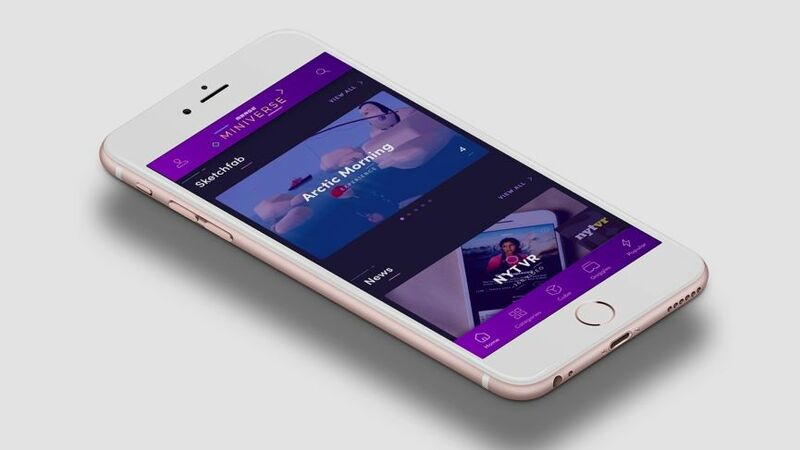 Currently, there are only 15 apps compatible over iOS and Android, while the company has its Miniverse platform online to give you a deeper look at what each offers and the latest on what’s to come. Most will see you paying $1.99, but there are some which are free downloads, and performance is generally seamless with the cube. All in all, this isn’t the most fleshed out selection of apps right now. But considering the Cube only launched in the US over the summer (ahead of a UK release before Christmas), plus the fact Merge that has only recently opened things up to developers, we expect to see this grow into quite the platform over the coming months.